The lighting you captured is absoluely gorgeous! Love the photo! It's been raining here in Chicago for days -- so it's a pleasure to see the sunshine's impact in an image like this! Wow!!! Is that nest just sitting on the rock like that? Amazing!! Where did you find your newest treasure? Was it too far into a tree to get a photo of it? or was it too high in say the nook of a barn eve? I do so enjoy visiting your farm even if it is just through the insites of what you share! 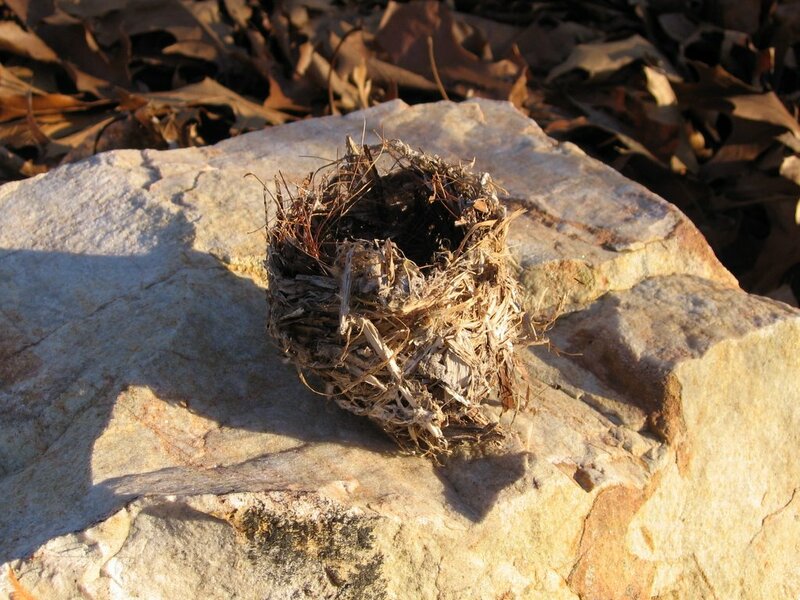 A bird's nest on an open rock. Beautiful, but how did it get there? Thanks so much. I've been lucky that the sun has shown itself a few times over the past week. So many more pictures pop out when it's sunny. I think this is one of my new favorite photos. Okay, no great mystery here. I did not come upon the nest just sitting on that rock. I found the nest laying in the middle of the ridge road above the farm where we walk every day. The light was really nice, and I love the color and shape of all those rocks (remember, I have a thing for rocks, too), so I decided to take a picture of the nest right there on the ridge. Then I carried it home to add to my collection.